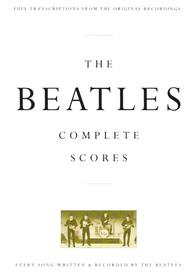 The Beatles - Complete Scores by The Beatles. For Bass, Drums, Guitar, Vocal. Hal Leonard Transcribed Scores. Popular boxed gift set. Includes complete transcriptions of all instrumental and vocal parts. Classic Rock, Pop Rock and Psychedelic Rock. Difficulty: medium-difficult. Complete score songbook. Vocal melody, lyrics, standard guitar notation, guitar tablature, standard bass notation, bass tablature, chord names and drum notation. 1136 pages. Published by Hal Leonard (HL.673228).ISBN 0793518326. With vocal melody, lyrics, standard guitar notation, guitar tablature, standard bass notation, bass tablature, chord names and drum notation. Classic Rock, Pop Rock and Psychedelic Rock. 7.25x10.88 inches.A fitting tribute to possibly the greatest pop band ever - The Beatles. This outstanding hard-cover edition features over 1100 pages with full scores and lyrics to all 210 titles recorded by The Beatles. Guitar and bass parts are in both standard notation and tablature. Also includes a full discography. Songs include: All You Need Is Love * And I Love Her * Baby You're a Rich Man * Back in the U.S.S.R. * The Ballad of John and Yoko * Blackbird * Can't Buy Me Love * Come Together * Drive My Car * Eleanor Rigby * From Me to You * Glass Onion * A Hard Day's Night * Help! * Hey Jude * I Saw Her Standing There * I Want to Hold Your Hand * Michelle * Penny Lane * She Loves You * Twist and Shout * Yesterday * and many more! Book is packaged in its own protective box. A must-own for any serious Beatles fan or collector! 7-2/8' x 10-7/8'.About Hal Leonard Transcribed ScoresTranscribed Scores are vocal and instrumental arrangements of music from some of the greatest groups in music. These excellent publications feature transcribed parts for lead vocals, backup vocals, lead guitar, rhythm guitar, bass, drums, and all of the various instruments used in each specific recording session. All songs are arranged exactly the way the artists recorded them.